David Winston Anderson is the Senior Pastor of RH Ministries located in Red Hook, Brooklyn. Pastor Anderson is the son of the late Rev. Winston and Anita Anderson who served faithfully at Westbury Gospel Tabernacle. God’s hand on Pastor Anderson’s life, was evident from a young age as he worked with his father at Camp Joharie and as a member of the Bethel’s Youth for Christ Choir. As an adult, Pastor Anderson continued to serve at Camp Joharie in the summers, speaking to the youth at their Sunday and mid-week services. In 1992, Pastor Anderson began working in the Jail Ministry. Upon his graduation from BBI in 1995, Pastor Anderson was released by Bishop Roderick Caesar to go to Westbury Gospel Tabernacle. Immediately he began to work in the Pantry Ministry with his father. Soon after, he along with several others, started the Spiritual Renewal Ministry, counseling juveniles in detention centers as well as adult drug counseling and marital counseling. In June, 1997 Pastor Anderson was ordained as Rev. David Anderson and continued to work at Westbury Gospel Tabernacle handling many of the ministerial assignments of that office until he was called and later installed as Pastor of RH Ministries. Today Pastor Anderson continues his work with those incarcerated as a Social Work Transporter/Investigator for the Legal Aid Society of Nassau County and as a Registered Nassau County Chaplain. Pastor Anderson has a passion for bringing the Word of God to those locked down but not locked out. 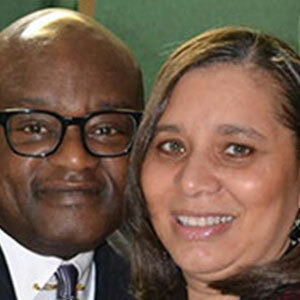 Pastor Anderson and his wife reside in West Hempstead, New York and are the proud parents of five children and have four grandchildren.